As soon as I saw the Harvest Moon inspiration for this month at Earrings Everyday, I was indeed inspired. The challenge came to my attention several days after it was posted and thus several days since the Harvest Moon had made its appearance. I had the pleasure of getting to see that moon in all its October glory. Simply recalling its beauty was all I needed to envision this design. I first considered what material would best represent the moon itself. Almost immediately I was struck with the image of mother-of-pearl buttons. Their holes and sometimes rough texture would be perfect to epitomize the moon. But, I didn't want them to hang loosely in the earrings, they called out to be set in the sky. Since I've been playing around with tin on and off for a few months, it seemed to be just the thing to use as the backdrop. And, utilizing a technique I picked up in a jewelry class, I was sure I could attach the buttons to the tin by folding the tin over on the buttons. At a local thrift store, I found a tin with a black lid. The base was a snowy city scene that I used to practice the design. It was good that I decided to practice as I had originally intended to only use one layer of tin. But, the propeller-like shape (middle) of the single layer made me change my plans to add the second layer. My initial plans changed again when I added the patina to the tin. See, the backside of the black tin was a brassy-gold that I was able to sand off for the most part. In order give the earrings an "aged" feel, I left some of the original color. When the dark patina was added, the brassy-gold really stood out and sparkled like stars in the sky. Since the fold-overs had this effect on them, I decided to flip the second layer so some of the sparkles would show up in the background too. Even the rivets went well with the bit of metallic poking through. 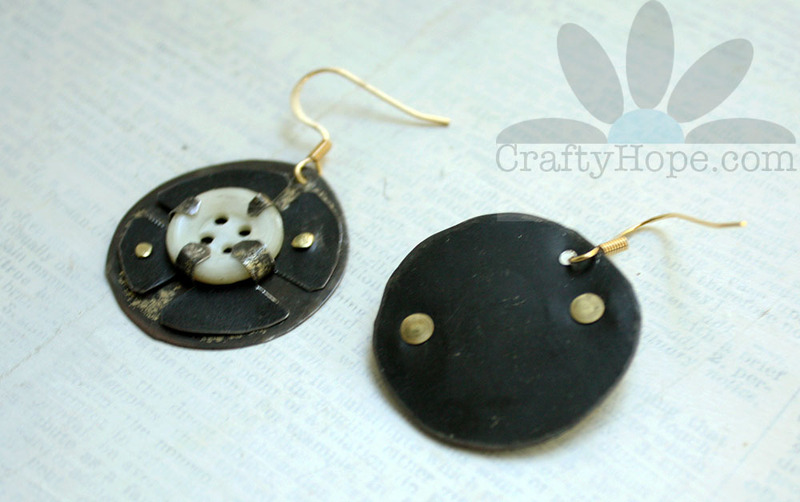 I see myself making many other pairs of earrings like these, combining tin and buttons - two found object materials I really enjoy working with. And, I see how I can improve upon this design and the process. For now, though, I'm totally smitten with my own pair of Harvest Moon Earrings. I'm linking up on the Earrings Everyday reveal post. I do hope you head over there and see how other artists were inspired by this month's theme. I know I'm looking forward to it. Thanks Tammie! Yes, we do both seem to be drawn to some of the same materials. I'm pleased you like these. That means so much to me. Thank you! As soon as I thought of buttons for this challenge, I couldn't shake the idea. I had to make it happen. I'm so glad you see it too! Yay! What a great way to do a setting - and a great new way to use buttons in jewelry! The mother of pearl was perfect for a moon inspiration. I love your earrings. It was very clever how you made them. I love to incorporate buttons into jewelry and cards so this post gave me a few more ideas of how to. Great job! Thanks so much! I'm so glad I inspired you as well. I can't wait to see what you end up making too. So fun and unique! I love how the rivets look like stars behind the moon! Yes! I'm so glad you see the rivets as stars too. I thought the same thing when I put them in. I even started to mention that in this post, but I thought it was overkill. Thanks for mentioning that you see it and thank you for popping in! Awesome! I wouldn't have thought of tin and buttons..Great piece!!! Thanks so much! Tin has been central to some of my design lately. It's been a fun material with which to work This project expanded my use of it for sure. I can't wait to continue to experiment. So glad you like these. Thank you!! They came out wonderful Hope! The tin looks like a really unique medium to work with. Thanks so much Susan! I appreciate that greatly!! Great design! I definitely have to add tab settings to my skills! Thank you! I definitely need to work on my tab setting skills. This took some practice and still isn't exactly where I want it, but I enjoyed the process for the most part. Thanks for hopping by!! This assemblage blew my mind! Ingenious and unique!